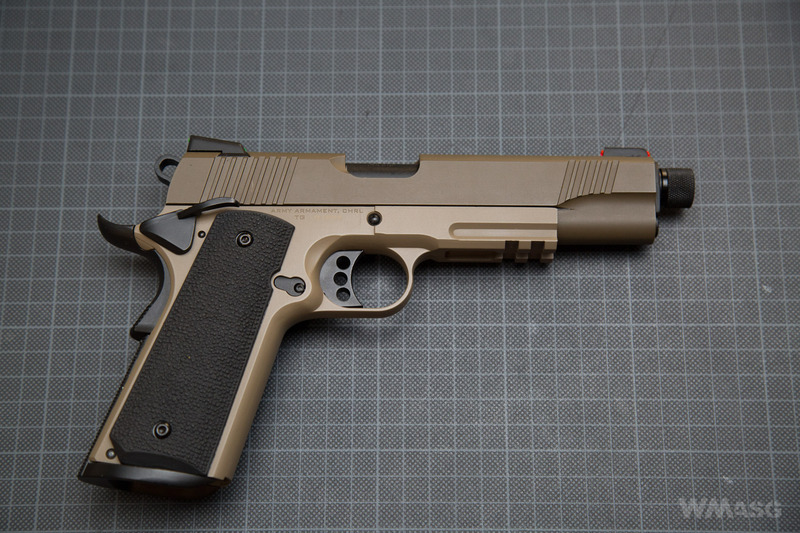 Tactical Colt 1911 with a silencer adapter and a 30 BB magazine. 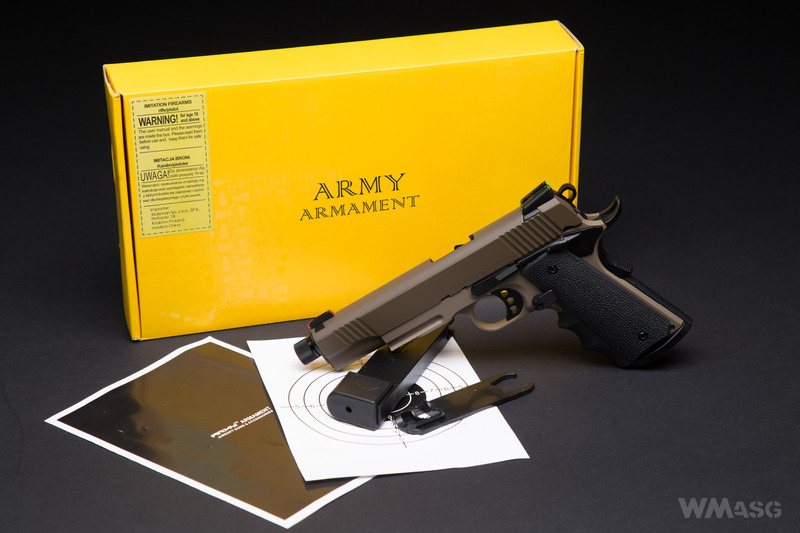 We got a new item from Army Armament - the R32 Sandstorm pistol, a replica of the Colt 1911 in a refreshed tactical specification. 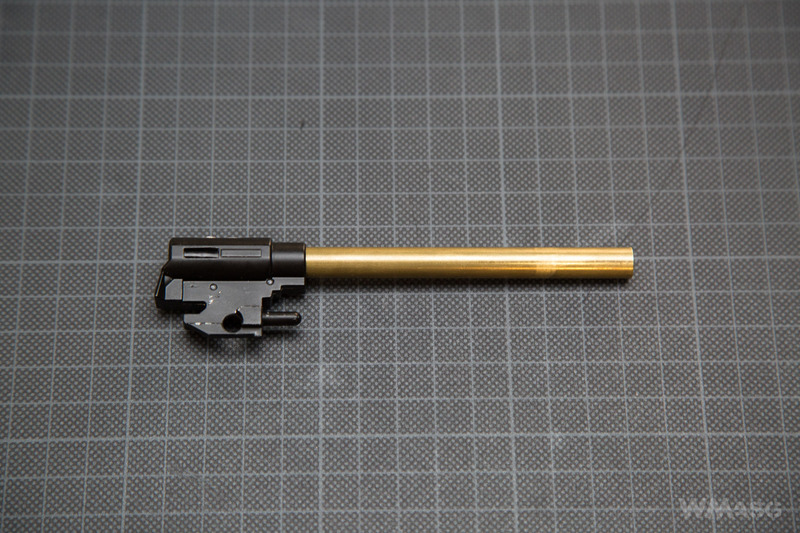 Of course, the replica is equipped with a blowback system. 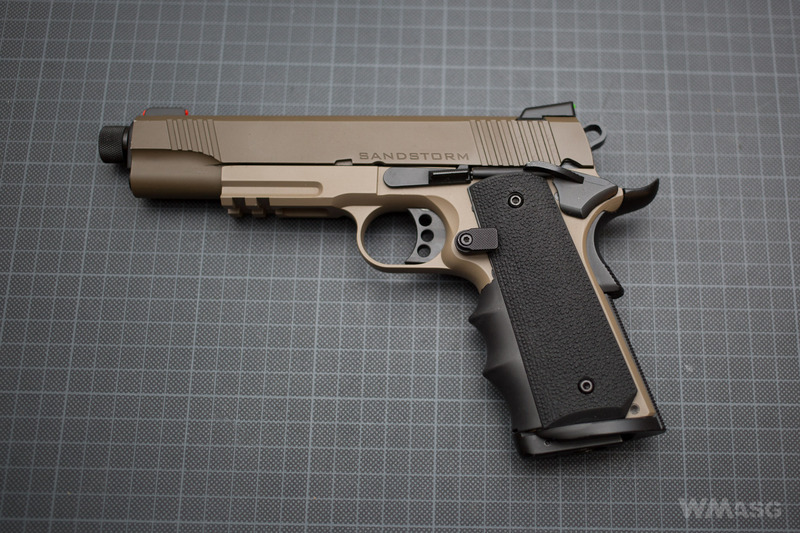 The manufacturer decided to release three color versions: the reviewed two-color Sandstorm version in dark earth and brown. The two-color Darkstorm (in black and gray) and the uniformly black Nightstorm. 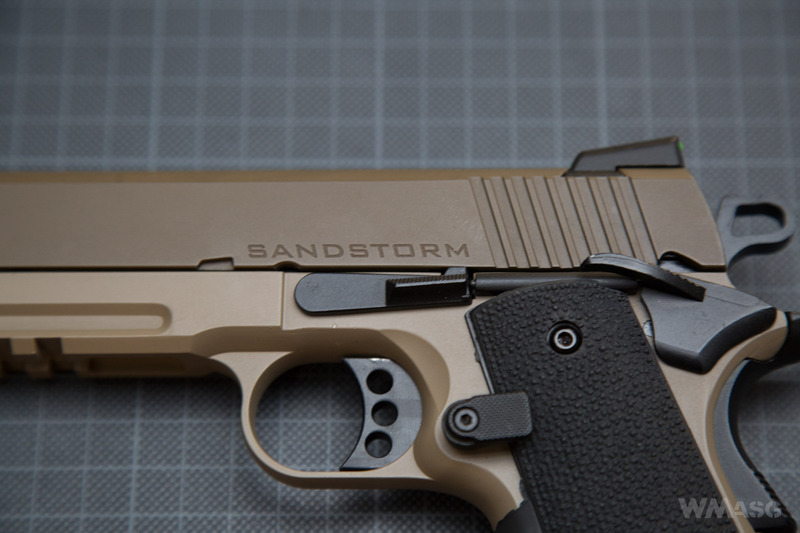 In many online sources, in which I was looking through for additional information, the pistols are described under the common name R32 1911 MEU with an appropriate note (Sandstorm, Darkstorm, Nightstorm). At the same sites , the information is repeated that the R32 series is a long-awaited replica. Well ... I suppose so. - an enlarged green gas magazine holding 30 BBs. 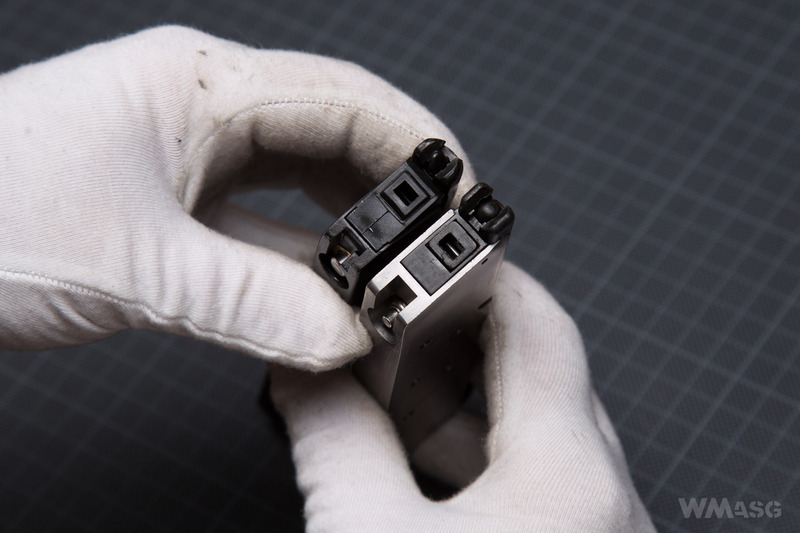 – new generation tightened magazine valves. 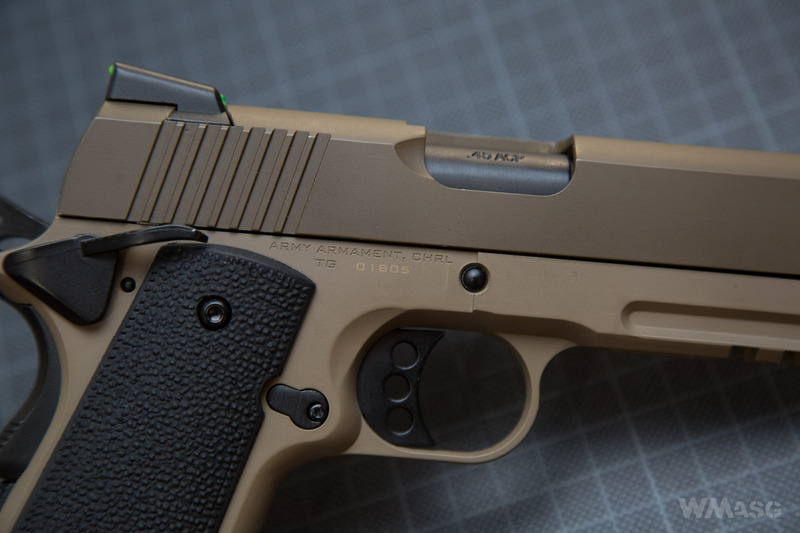 A particularly noteworthy feature is the unique serial number of each gun. 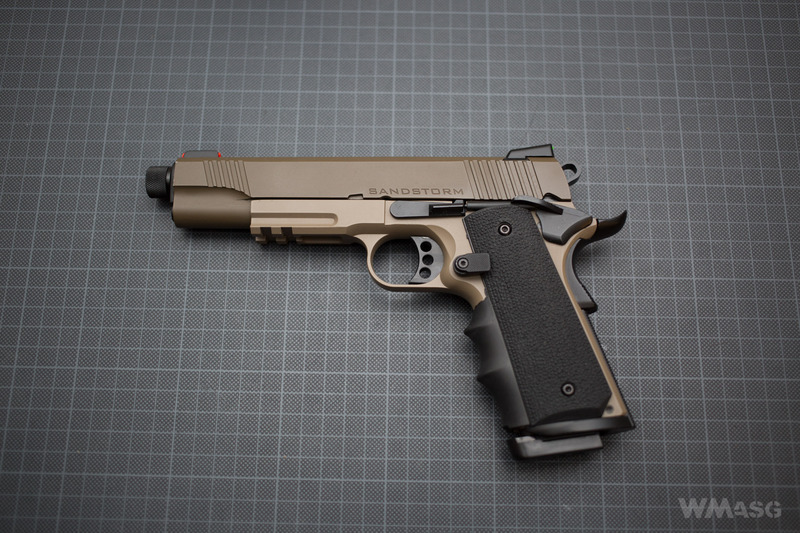 This is still not a standard among replicas in general, and among handgun replicas in particular. In Poland, a serial number is only a nice addition, but for example in Spain, it is required to register a replica. 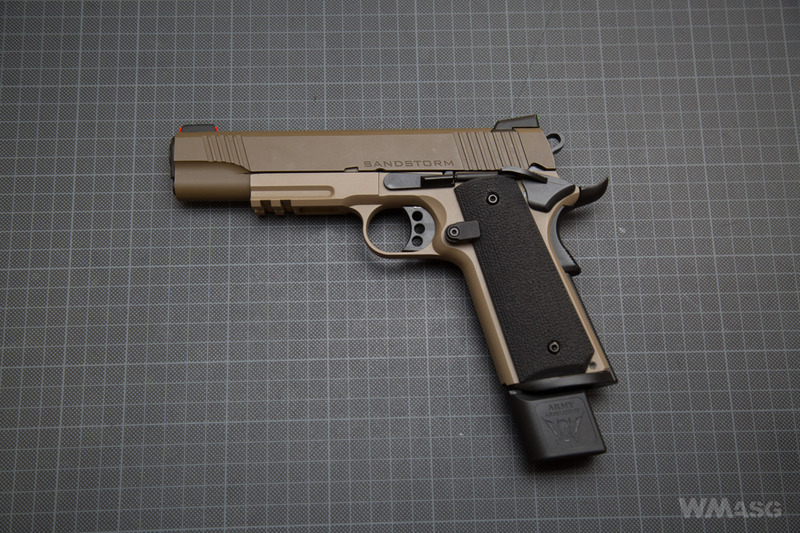 On the Internet you can find information about the compatibility of the replica with magazines dedicated to the Colta 1911 / MEU by Tokyo Marui. I had the opportunity to check it with one magazine. They do not fit. The KJW magazine from MEU by this manufacturer does not fit the R32. More details on this are given later in this text. We get a replica in a single-color box that lacks any marketing values. One can probably say just two things about it. First - it is difficult to miss it, second - due to the insert made from Styrofoam, it performs its protective function perfectly. The set itself is very modest; apart from the replica, we receive a universal and not very detailed manual in on of the Asian languages and a single-page Polish-English comic book style leaflet about keeping your fun safe. A simple shooting target is printed on the other side. 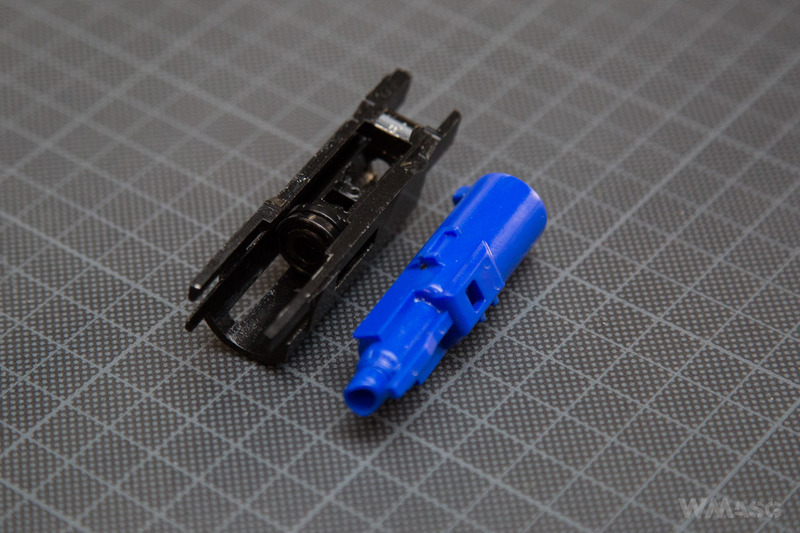 The set also contains a key made from plastic, modeled on the keys used for disassembling the real firearm. I have disassembled and assembled the replica several times without using the key. 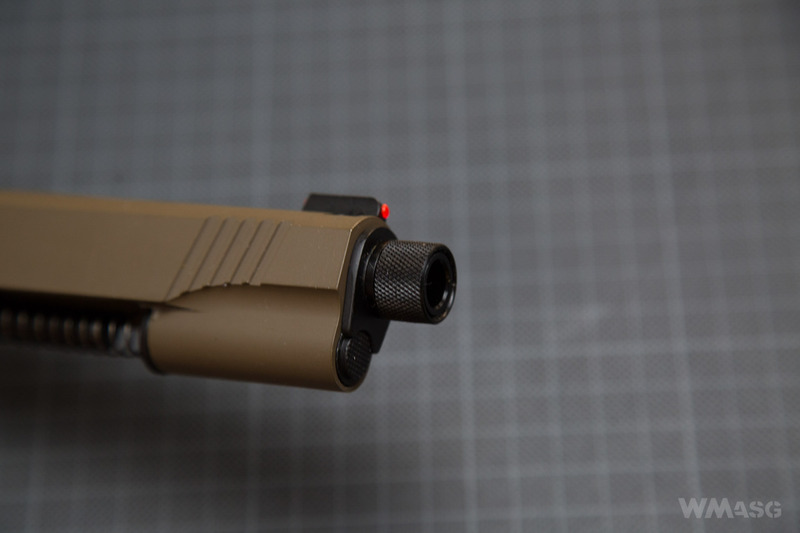 - silencer adapter thread: 14 mm counterclockwise. Out of the box, my impressions of the replica are moderately moderate. I mean, I do not see any reasons for getting excited, but there is also nothing that bothers me. 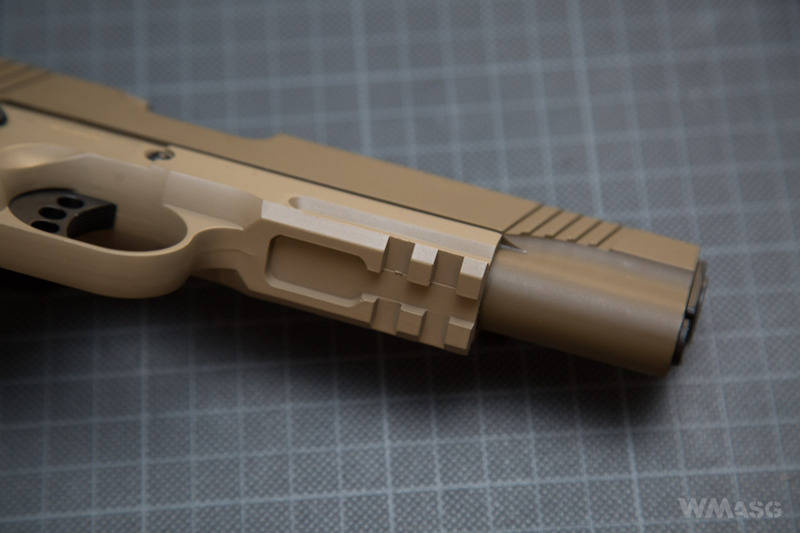 The gun is made clean and neat, and looks really good in this two-color edition. One downside is the slight slack of the slide and barrel, typical of Army Armament replicas (but also other manufacturers). In principle, the slack of the slide is minimal. 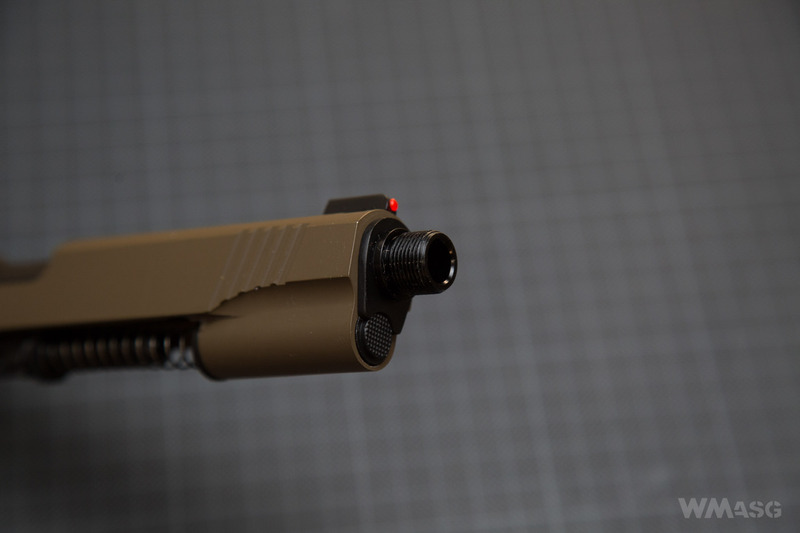 What you really hear is the external barrel, which moves freely along its axis by a good 7 mm forward and backward. In my opinion, its too much. A slight con for this replica. 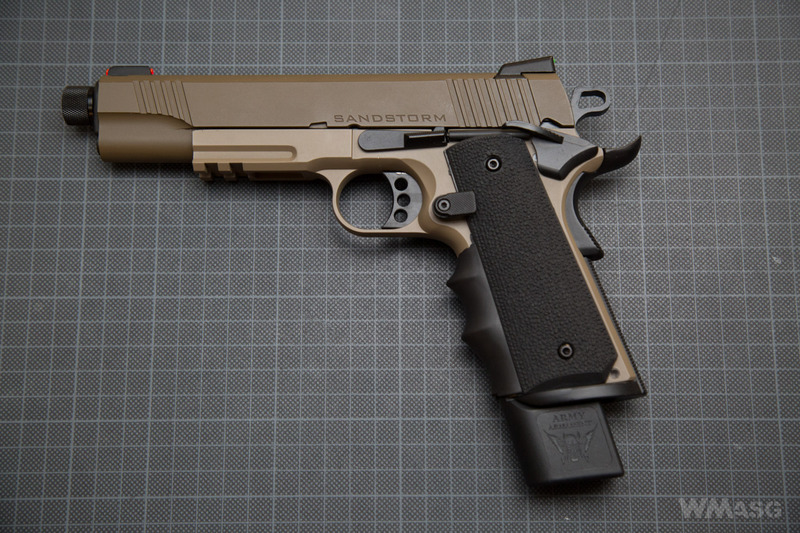 The trigger is an framework design, characteristic of contemporary Colt 1911 clones. 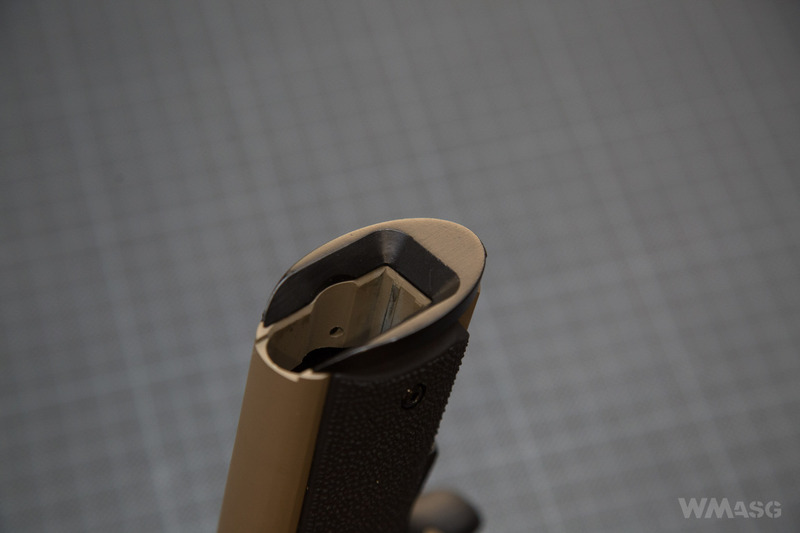 Directly in front of the trigger guard, the frame is shaped like a rail for mounting additional accessories. I will not describe the ergonomics of the gun, mainly due to the year when the original firearm was created. 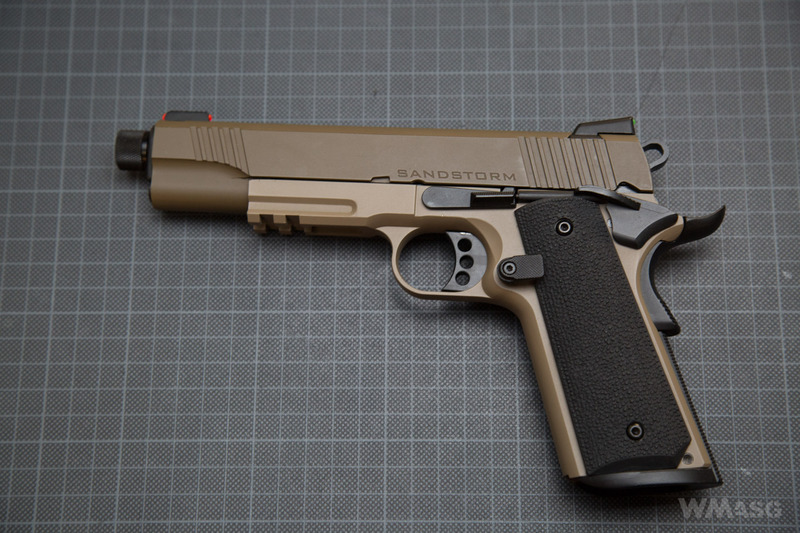 For those of you who hold ergonomics in high regard, you should probably look for designs other than the Colt 1911. However, the gun fits firmly in ones hand. 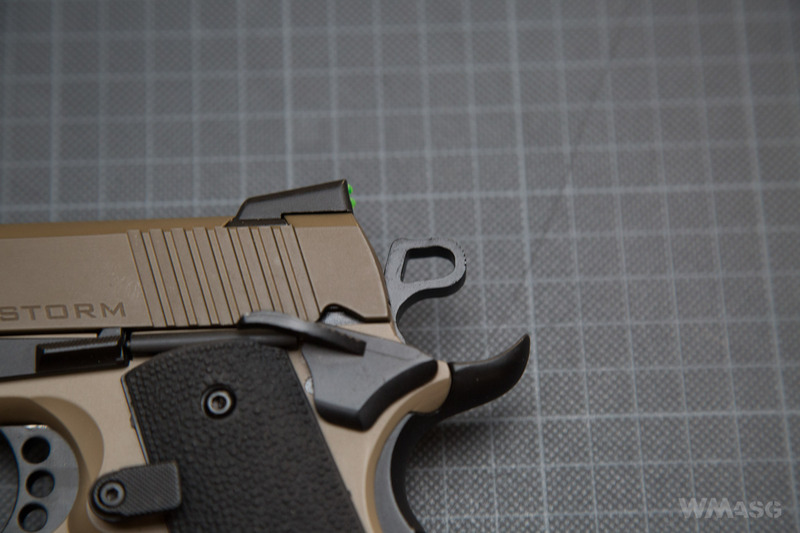 This is certainly due to the texture of the grip panels and the profiled rubber pad. 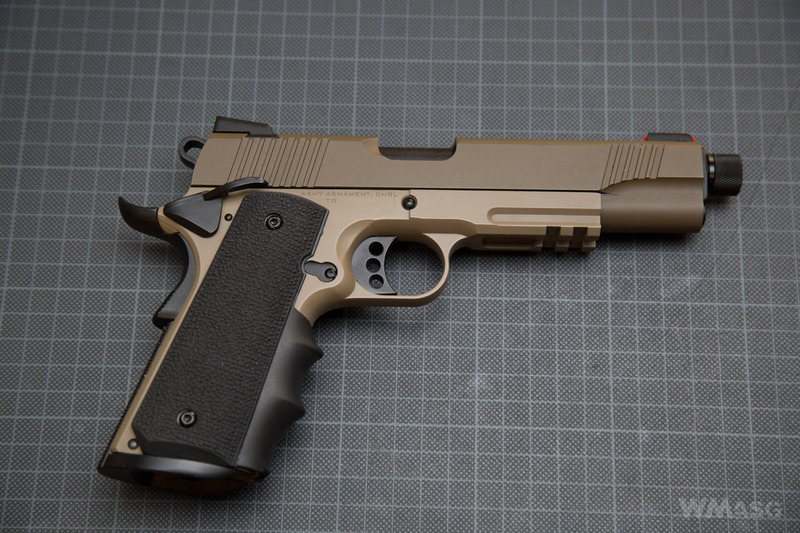 However, the grip might be too big for people with small hands or rather with short fingers. 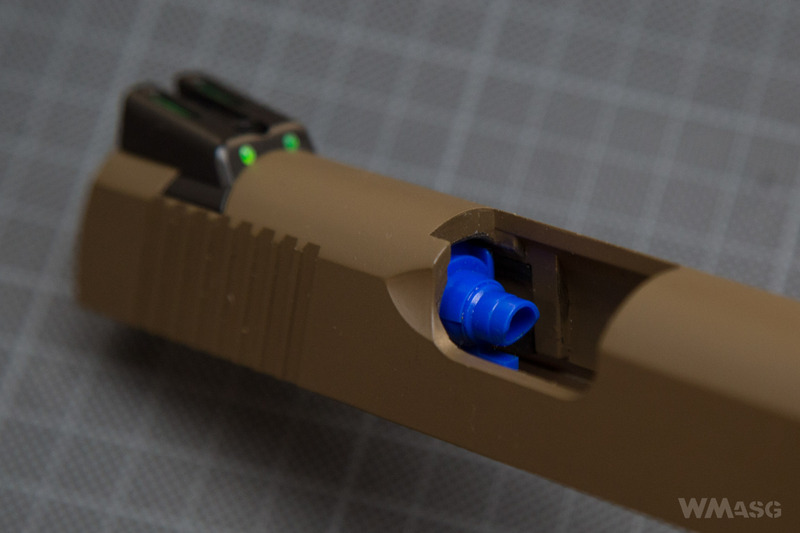 To make reloading easier, the magazine is equipped with a magwell, a funnel-shaped overlay that facilitates quick and effortless exchange of a magazine. 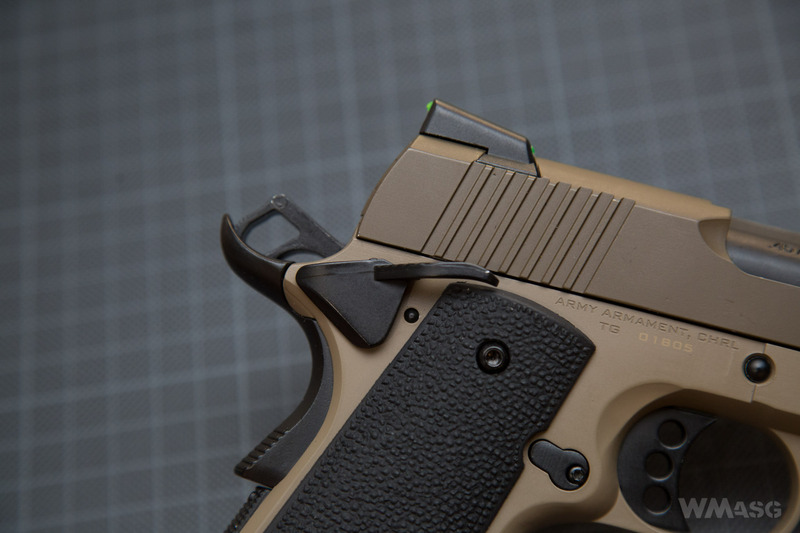 The pictures below clearly show the double safety feature, characteristic for the Colt 1911 clones and their derivatives - a standard push button in the grip and switch just under the hammer. 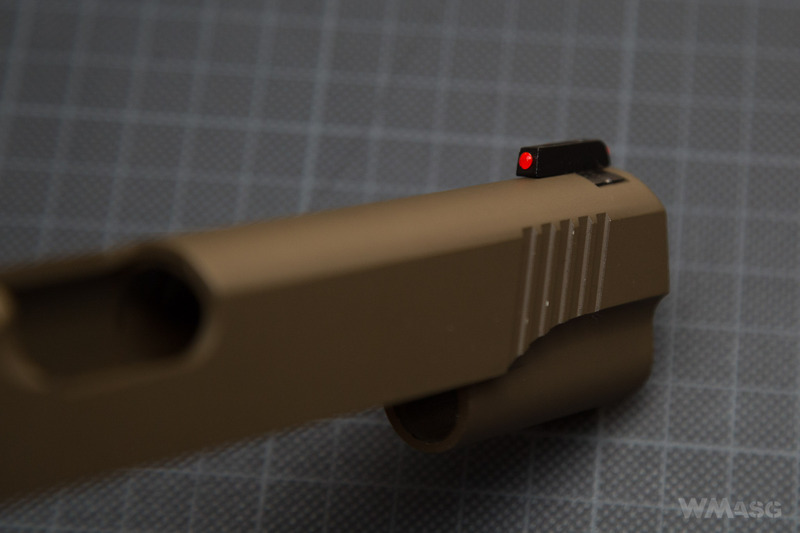 In the R32, the safety switch is double-sided, for right and left-handed shooters, in accordance with the trend that has been in popular for several years now. 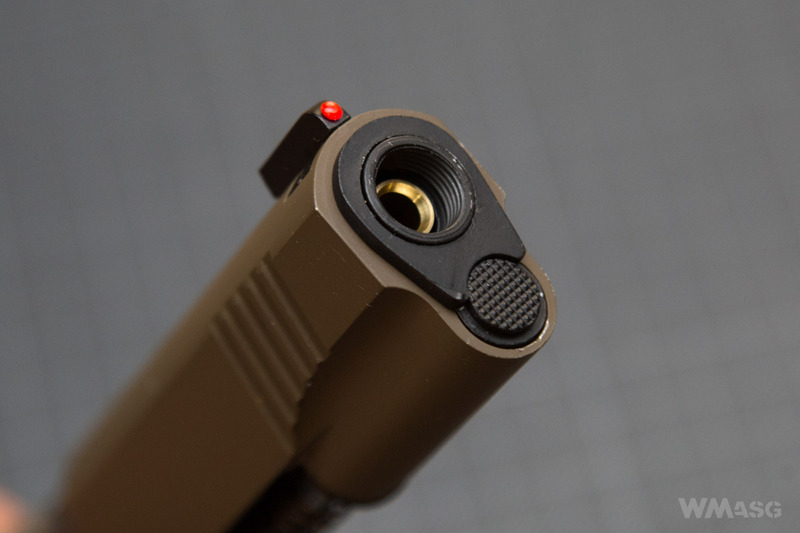 It might is obvious for everyone, but I will remind you that the safety push button in the grip prevents you from pressing the trigger, and safety switch blocks the trigger and prevents the moving the slide. For safety reasons, it is advisable to use the safety switch. 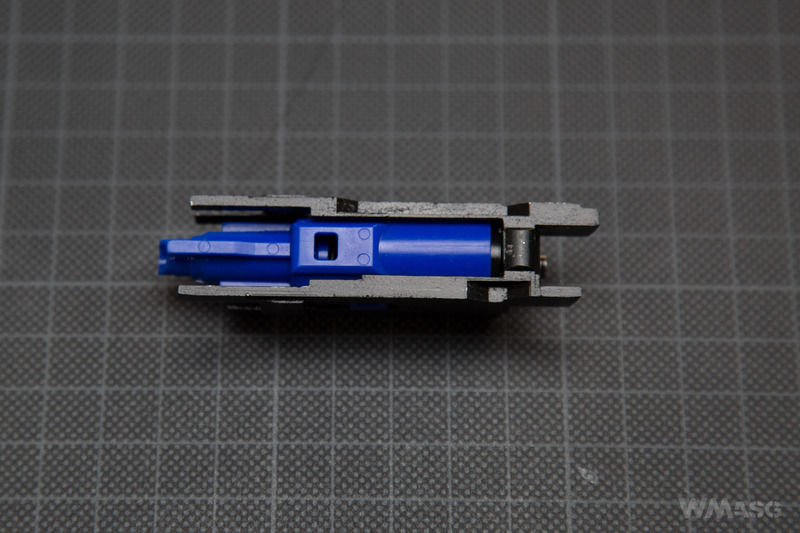 The R32 has a characteristic framework hammer. 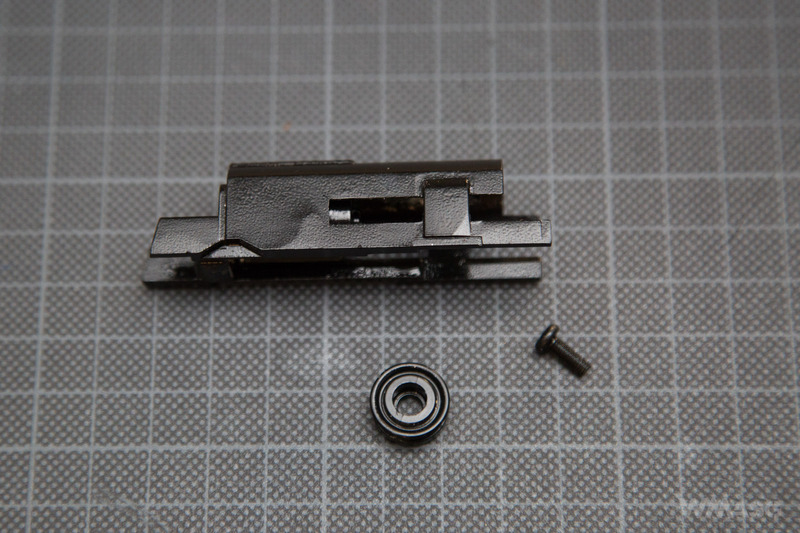 In many available descriptions of the R32 replicates, information about an enlarged magazine latch is present. Without going too deeply into the semantics - the magazine latch, and thus the part keeping the magazine in place, remained unchanged. It is not enlarged and works like in other replicas. 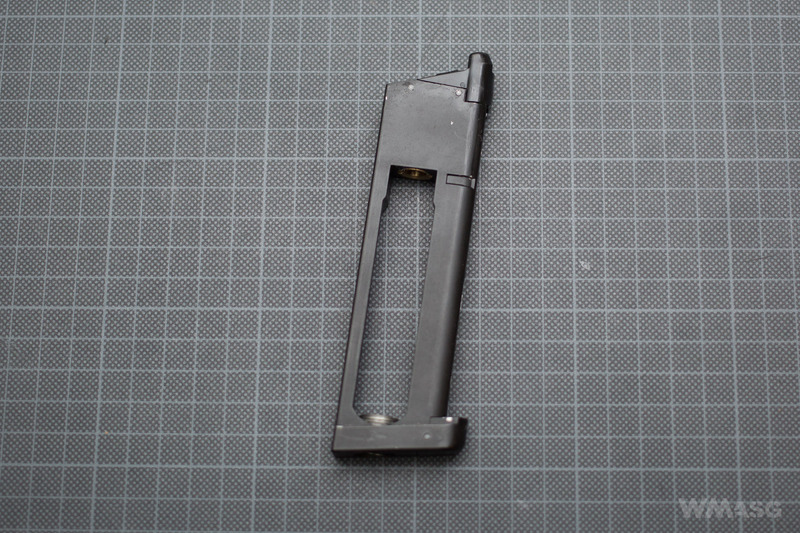 The button used to release the latch and replace the magazine is enlarged. Enlarged buttons are often used to facilitate handling a gun in gloves, under stress or under time pressure (e.g. in sports). Using them often requires getting used to - you have to master your movements as not the press anything by accident. Basically, I would not write about it at all, but an enlarged button, in combination with a weak spring, means that it is often accidentally pressed. I made a lot of attempts and unfortunately I repeatedly picked up the magazine from the floor. 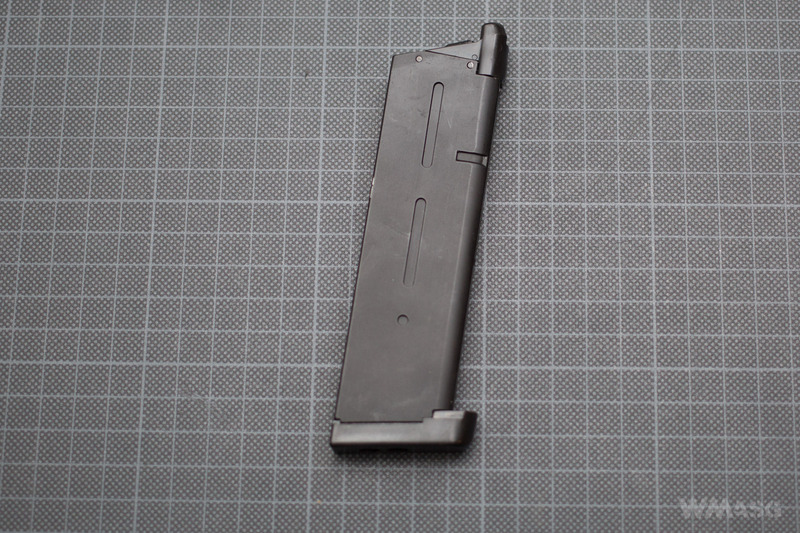 The issue is further complicated by the considerable weight of the extended magazine (246 g empty and 257 g with gas and 0.2 BBs). Below is an almost identical looking replica, the Army Armament R28 (TG-1) dark earth / brown, in which an extended guide is used. The photo comes from the website www.taiwangun.com. The adapter for mounting a silencer. 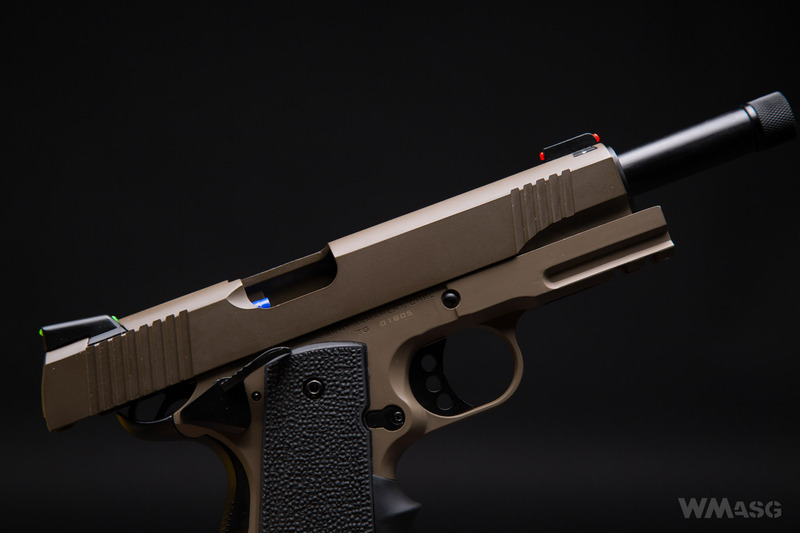 At first glance, the barrel of the gun looks extended, because it seams to protrude 13 mm from the slide. 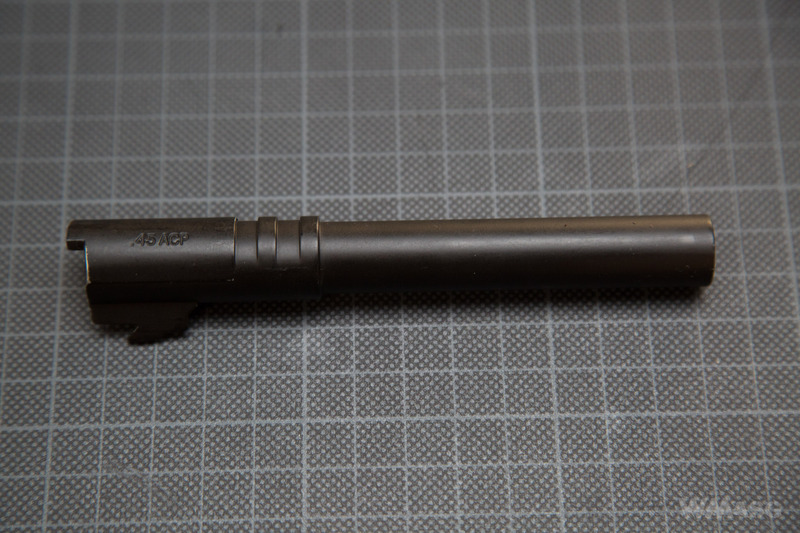 In fact, this is the adapter used to mount a silencer. 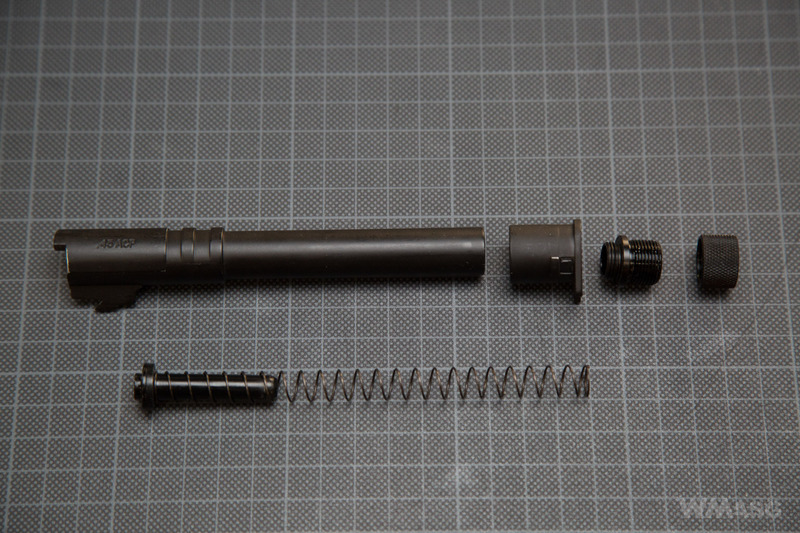 After unscrewing (counterclockwise thread) the knurled sleeve we can screw a silencer on. 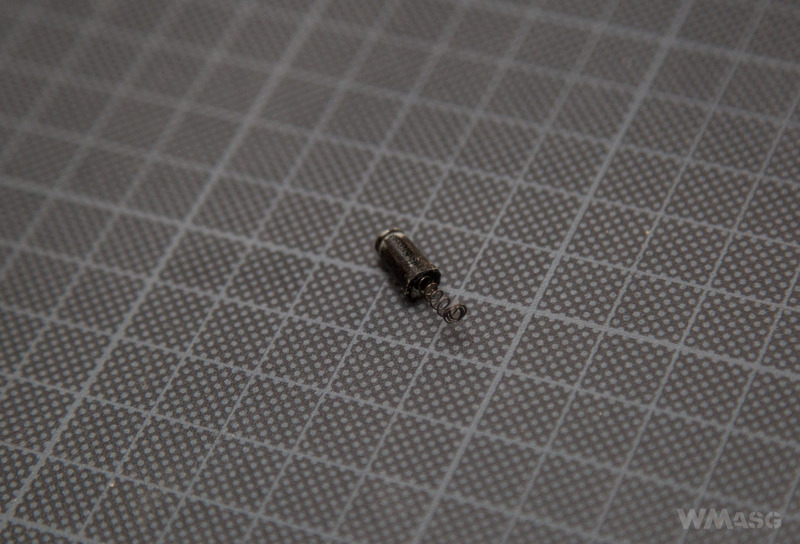 The adapter itself can also be unscrewed (also a counterclockwise thread). 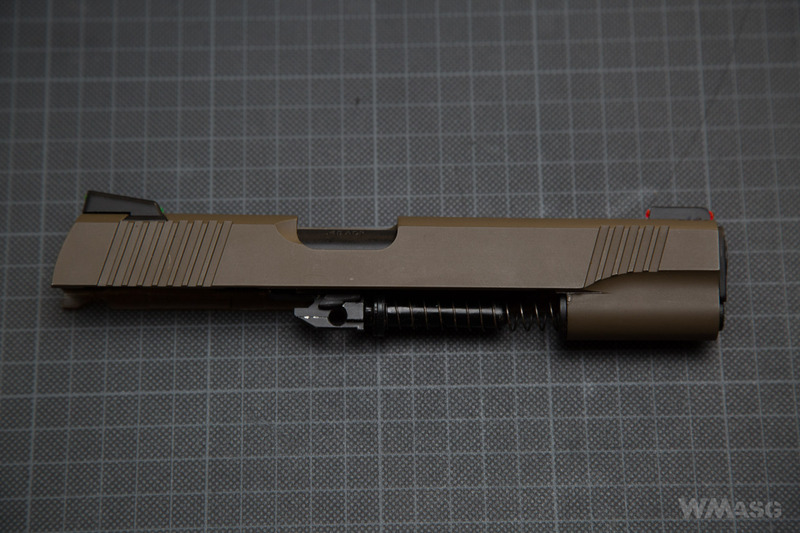 Now you can see the actual length of the barrel, and the pistol looks more traditional. 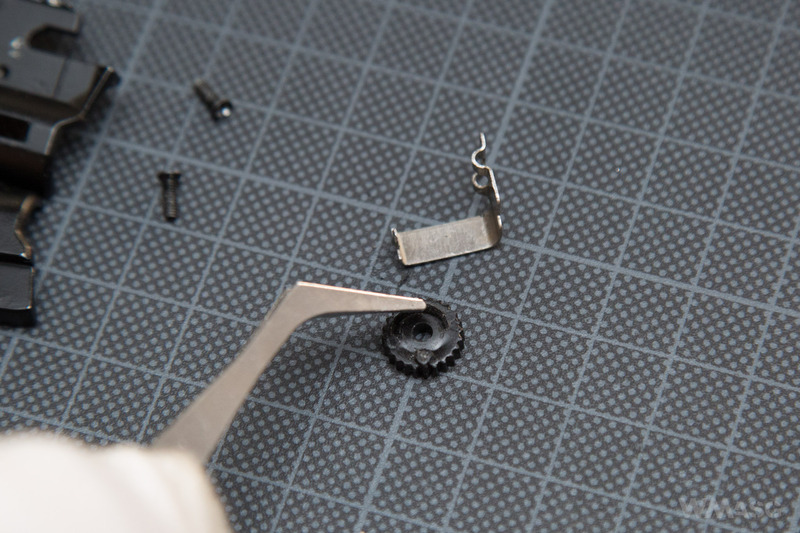 The picture below also shows it with the profiled pad disassembled. 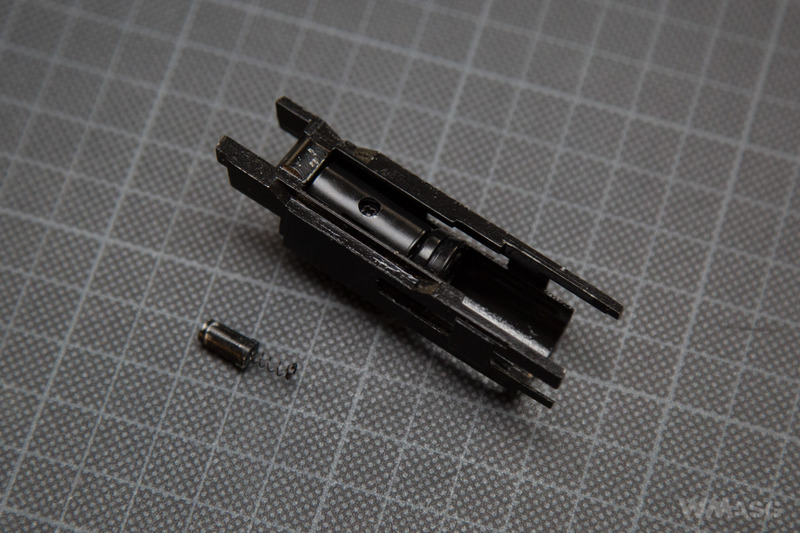 The R32 has, as several other Army Armament replicas do, "optical fiber" sights. The sights are not adjustable. 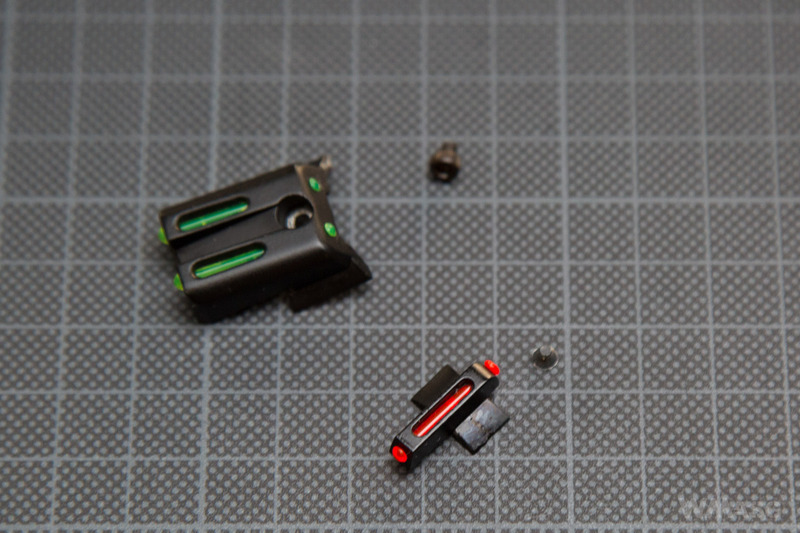 The rear sight uses two bright green plastic rods. 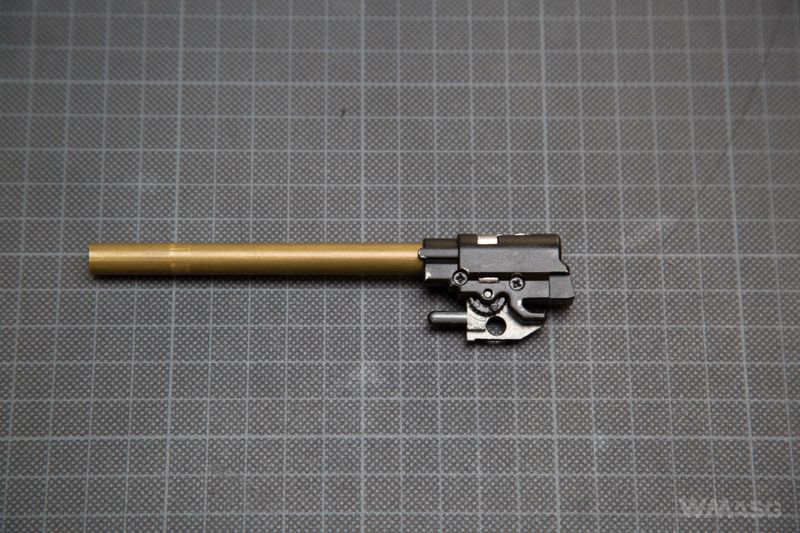 The front sight uses a single orange rod. 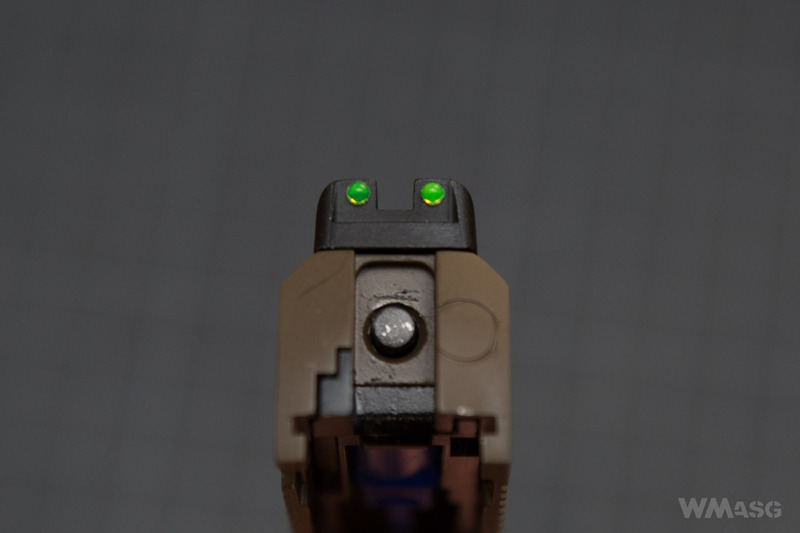 This type of sights does make it easier to aim in unfavorable lighting conditions. 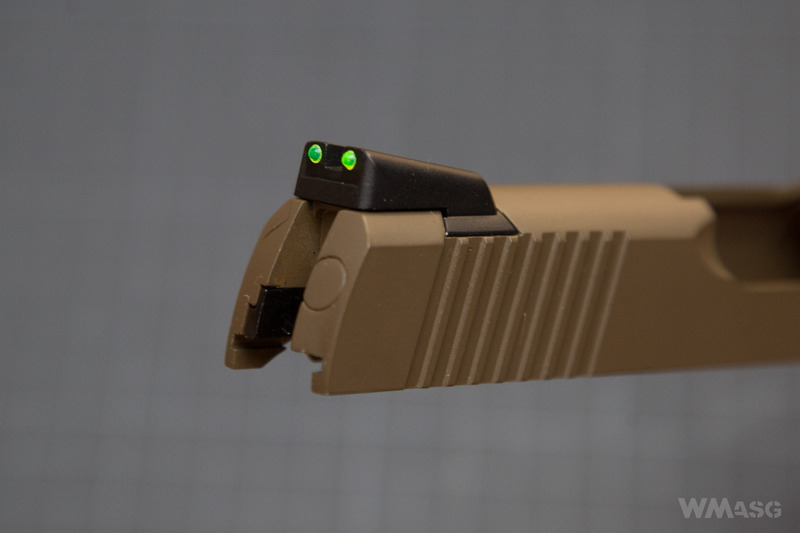 In the tested unit, the front sight had a slight lateral slack. 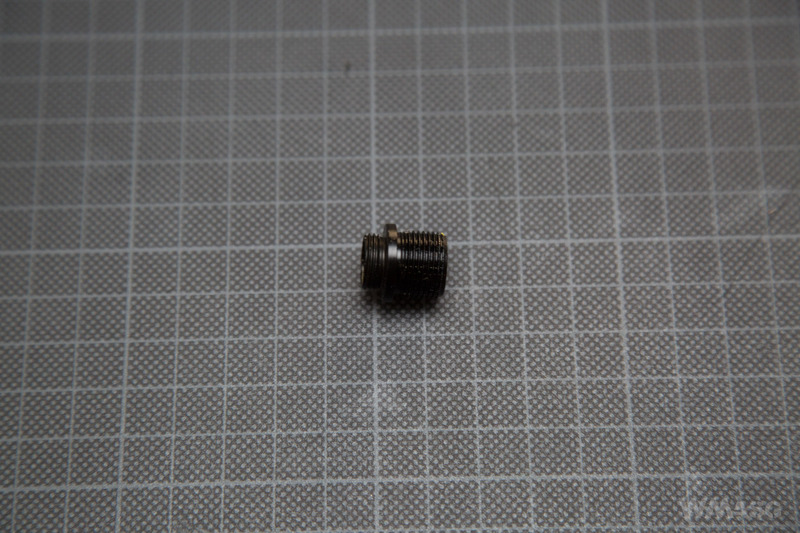 Tightening of the mounting screw did not help. The slack is easy to eliminate but required a bit of work. 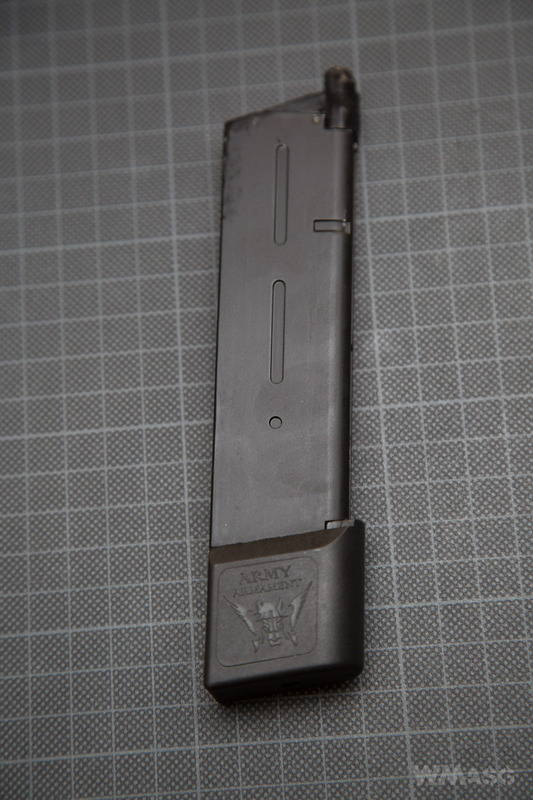 Just like many other Army Armament magazines, this one also has an extended feeding channel. 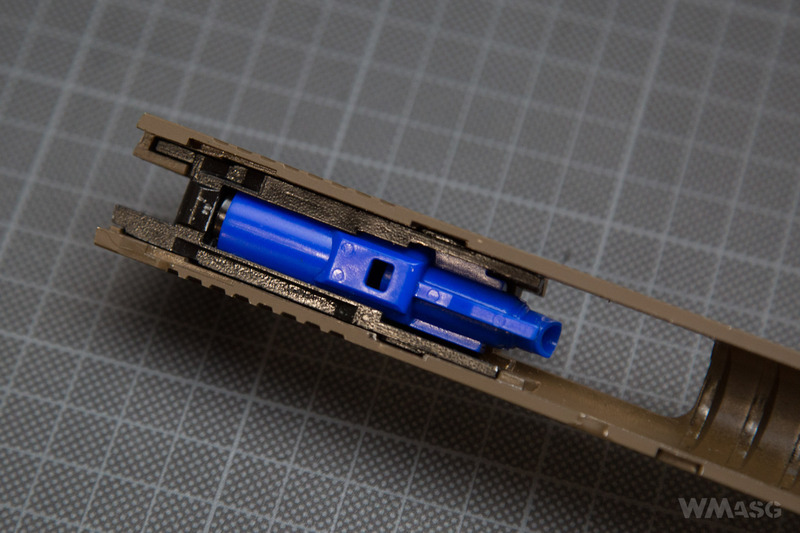 This is a very useful and convenient solution, because you can use a BB speed loader without an easy-to-lose adapter. This also protects the magazine's jaws that are often subjected to damage. The manufacturer ensures that it uses a new generation of valves, which improve the comfort of gas loading, reduce its consumption and ensure gas tightness and smooth operation of the replica. 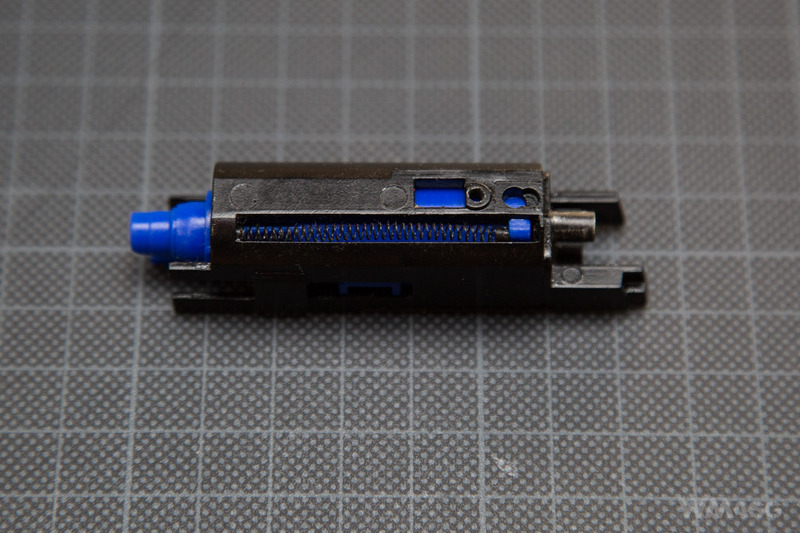 Below is the charging valve. 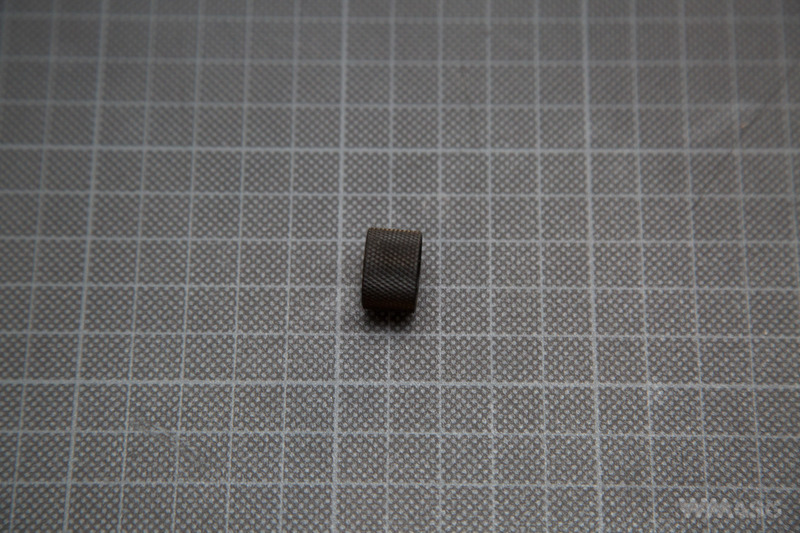 The plastic magazine floor plate has been removed only the valve is shown. 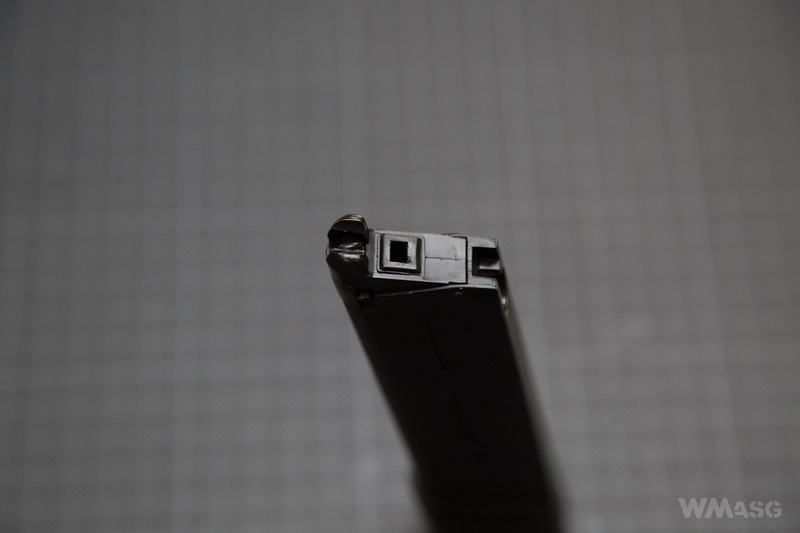 During normal operation, the magazine is charged with gas through the hole in the footer. Well... 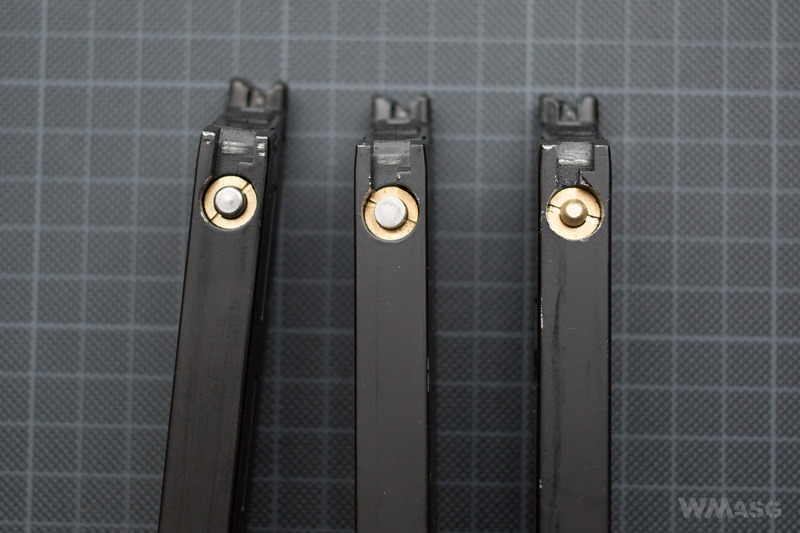 I never feel any discomfort when I was loading gas magazines of many pistols. However, the truth is that you can fire all 30 BBs on one tank. I have checked that many times. The differences can already be seen by putting the magazines side by side (Army is on the left). 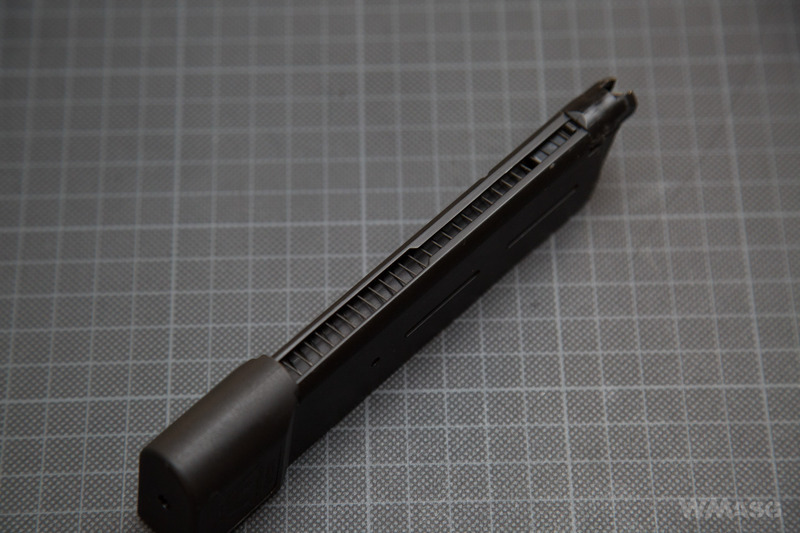 The Army's gasket protrudes over the upper surface of the magazine. The shape of the jaws is also different. 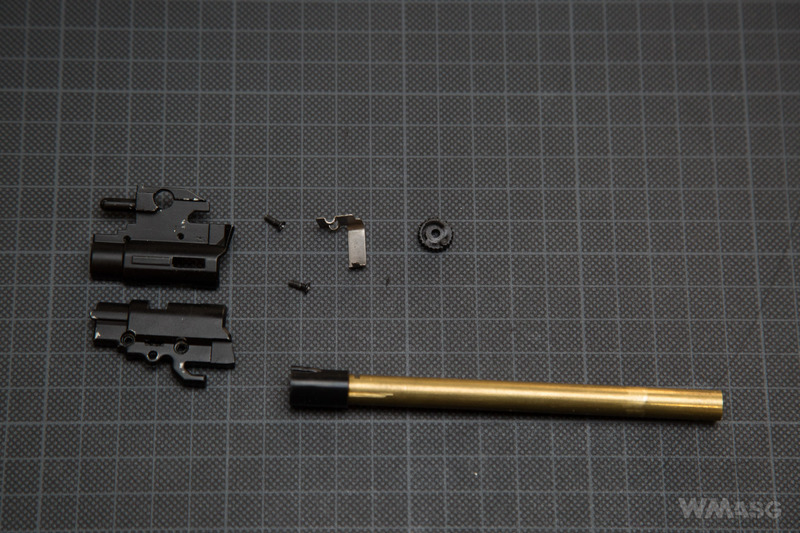 The final verification, however, is the failed attempt to insert the KJW magazine into the Colt by Army - the magazine does not fit into the pistol grip at all, not one bit. The photos below show a comparison of dimensions. That would probably be it as much when it comes to knowledge taken from the Internet. 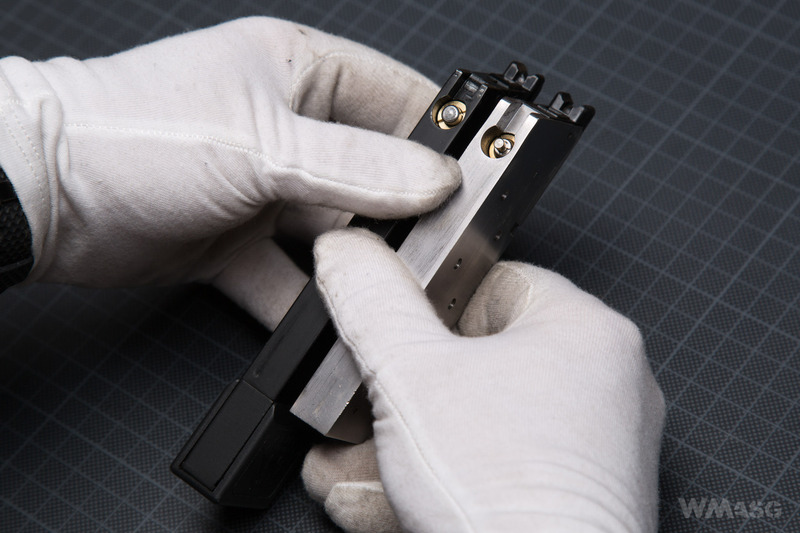 The ability to disassemble the slide is a must, because only in this way can you access the Hop-Up adjustment. 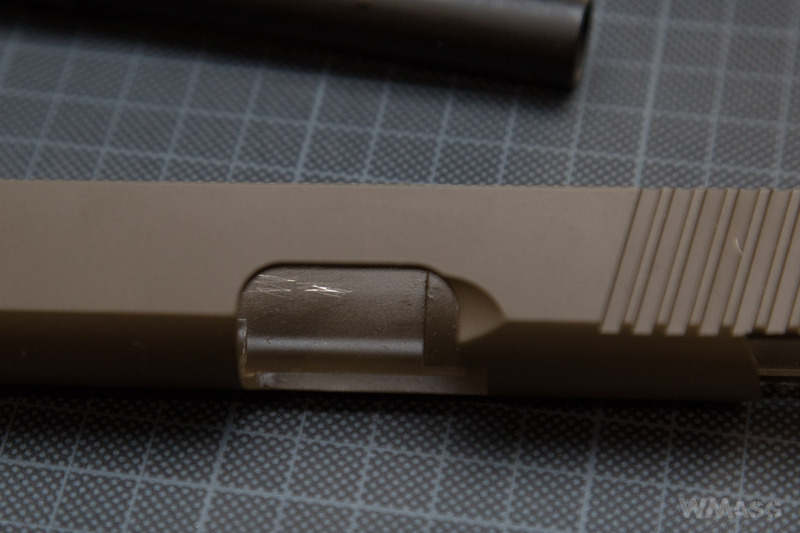 For those who have never done this: the slide should be moved back to the position where the first notch on its left side aligns with the outer latch and than pull out the latch itself. The easiest way to do this is by pressing its axis on the other side of the slide. 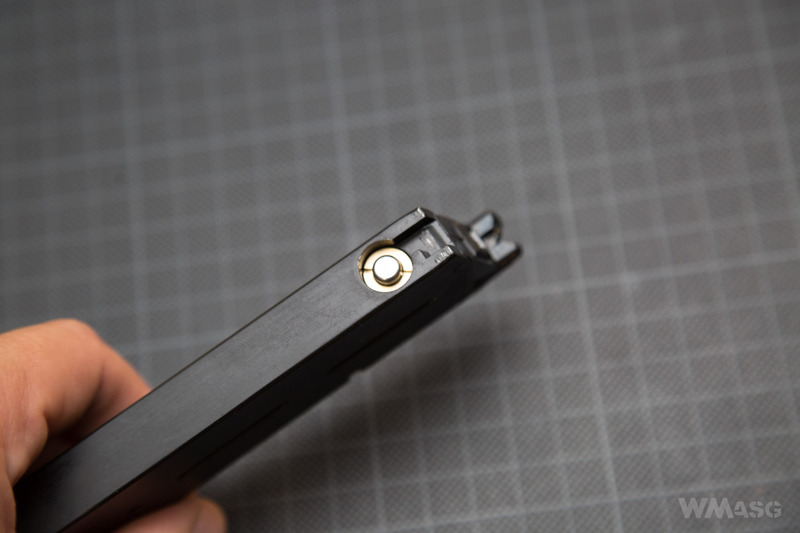 After removing the latch completely, push the slide forward and off the frame. 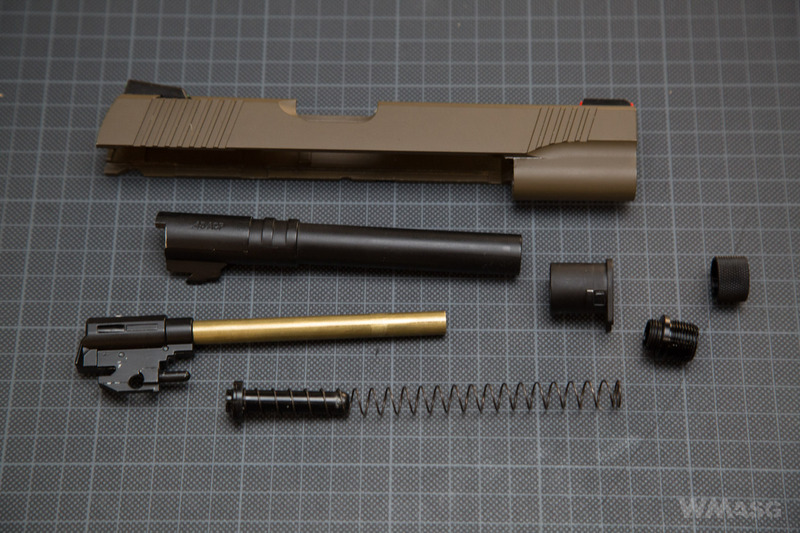 The pictures below lack the previously unscrewed silencer adapter. Of course, the slide can be removed without unscrewing the adapter. 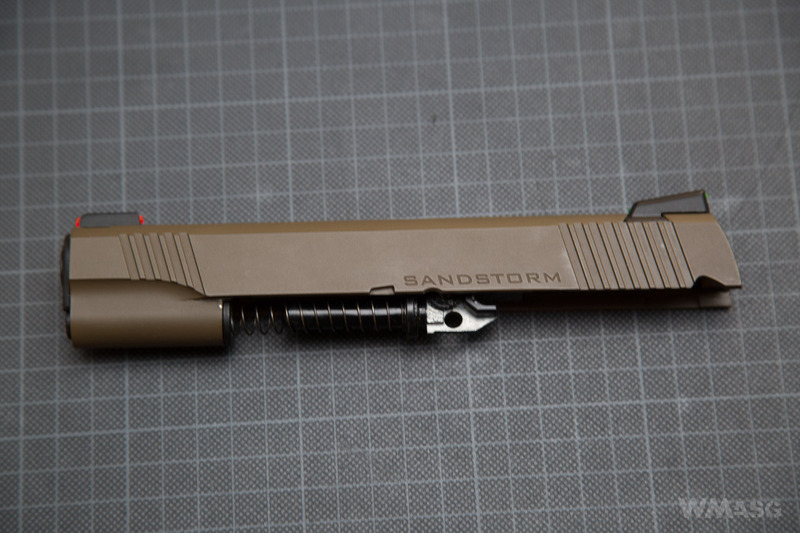 Directly below the letter "n" in the word "Sandstorm", you can see the Hop-Up control knob. To adjust it, you have to remove the slide. It may be necessary to further disassemble the replica for cleaning or maintenance. 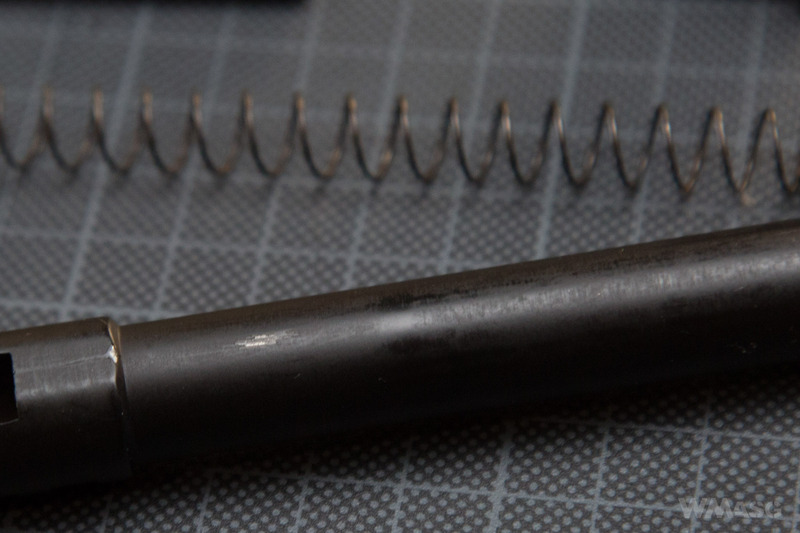 We start by moving the guide that leads the springs towards the end of the barrel and remove it from the pin on which it resides. Next, we pull the spring guide's sleeve to the rear and rotate the lock covering the outer barrel at its end by about 40 degrees. 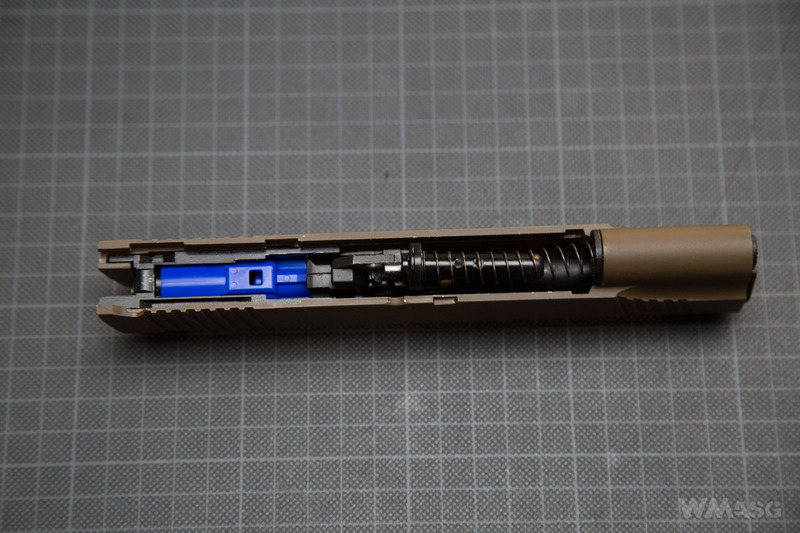 Now we can pull the barrel from the slide. We separate the inner barrel and the Hop-Up chamber from the outer barrel by pulling it back by the chamber, or by tapping it gently. 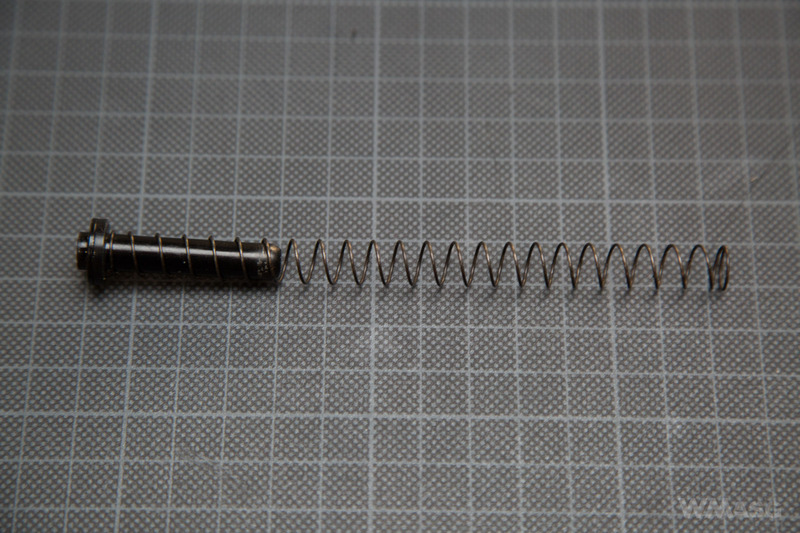 The photos below show that there is no sleeve leading the return spring. It was lying outside of the photo frame, I'm sorry. In the tested unit, the Hop-Up adjustment did not work as it should. The knob could be turned only to the position where the indicator was set at 5 o'clock, although the design allows for further rotation until the position is set at 3 o'clock. The reason behind this was the fault knob manufacturing, visible after disassembling the chamber - they are not difficult to remove. Loading the magazine with gas and BBs does not cause any problems. The valve accepts gas without hissing. Also, widening the feeding channel works well. The firing sound is loud. The strength of the blowback system, in my opinion, is above average. 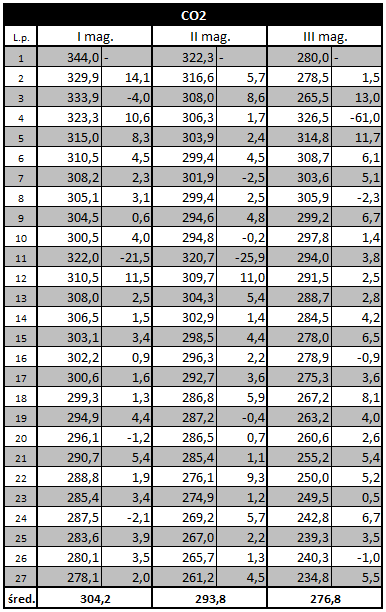 The first few shots seemed to be stronger, with a stronger kick (I did not shoot through the chronograph). Subsequent measurement confirmed this observation. 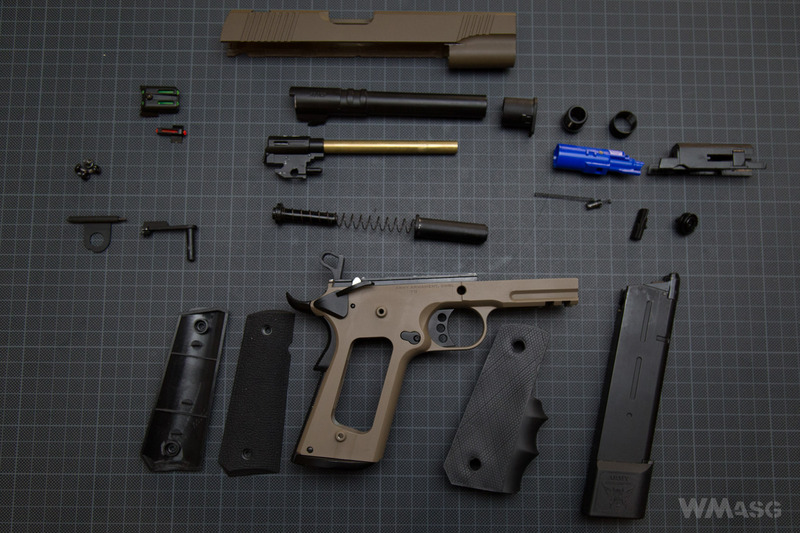 Hop-up adjustment is uncomfortable as in most replicas due to the need to remove the slide. It works well for 0.20 g and 0.23 g BBs, although the control knob does not work in full range. The validity of using 0.25 g BBs without fixing the knob's operation seems debatable to me. The tests were carried out on our own enclosed shooting range, at an ambient temperature of 24ºC, the Hop-Up was set to zero. 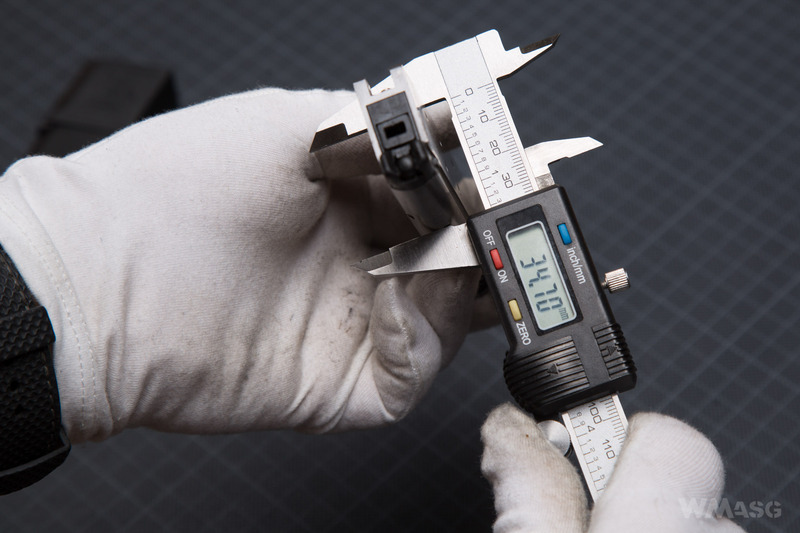 The measurements were made with the XCORTECH X3500 chronograph using Nurpol 0.2 g BBs. ProTech brand gas was used, filled from a half-full tank. At one gas fill you can empty the entire magazine - 30 BBs. The last BBs left the barrel at 256.1 fps. The difference between the first and last shot on one gas filling is close to 40 fps. That's a lot. 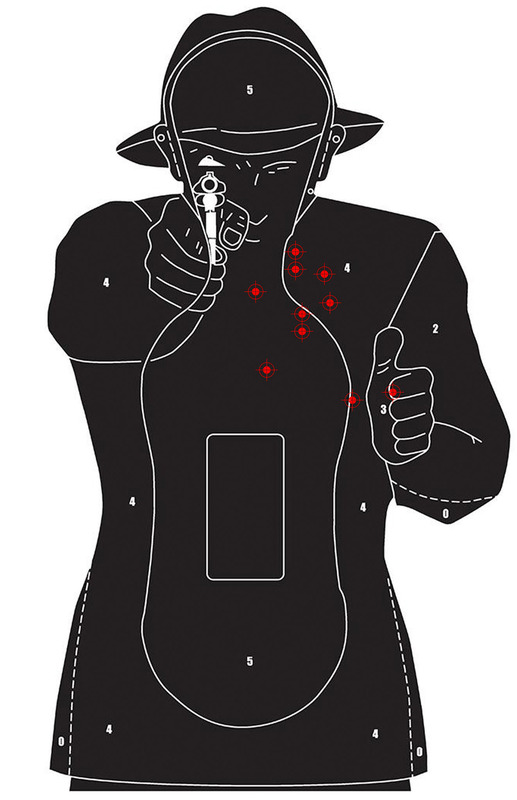 The conditions were as described above, the range to the target was 10 m, the replica was held by the K-Zone shooting rest. All shots hit the target. 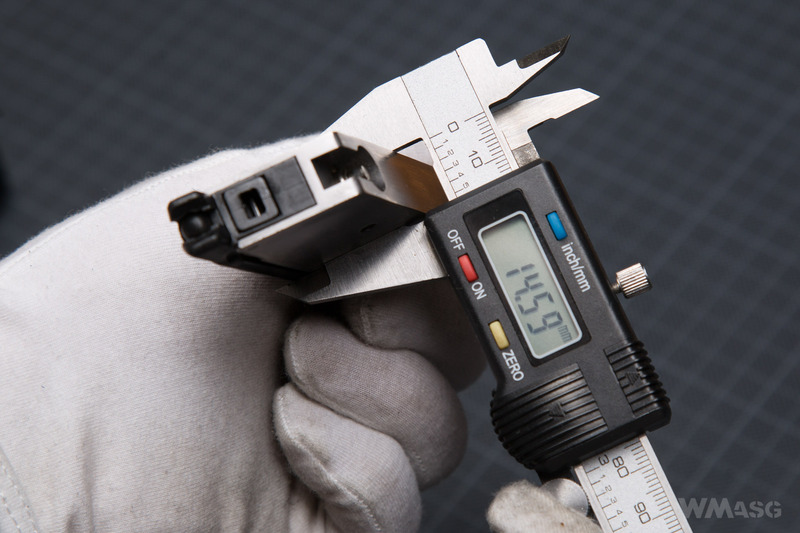 The maximum distance between BBs - 15,5 cm. 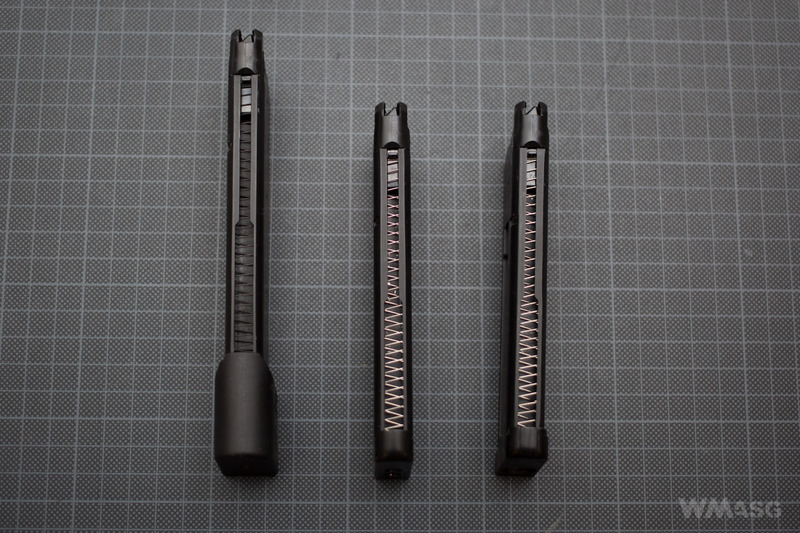 - reinforced frame and internal parts allowing for the use separately purchased CO2 magazines. 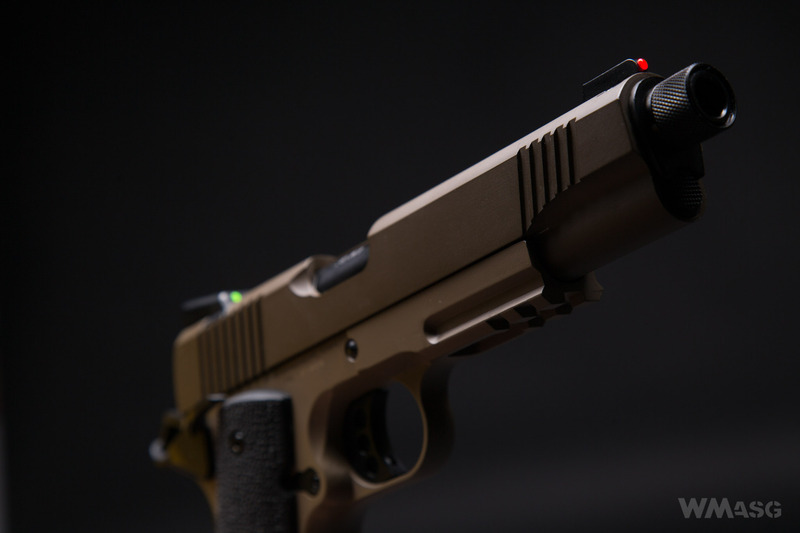 - a clear drop in muzzle velocity as the magazine has less gas. And one more thing ... 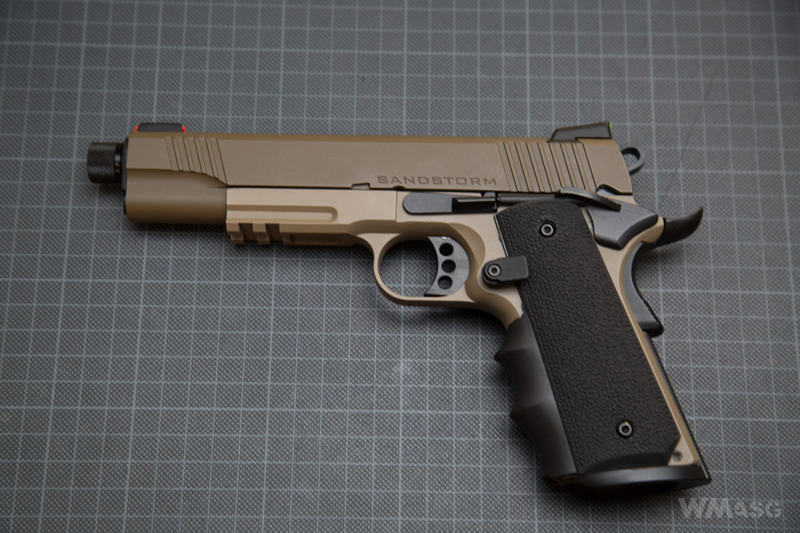 In the "pros" I mentioned, among other things, the possibility of customizing the pistol. I meant the possibility of disassembling some of the additional equipment and giving the replica a more classic look. For me, this is a very serious advantage. Would I buy this replica? For 350 PLN? This is not a flawless replica. It is also not a replica for a connoisseur. But as a sidearm, it will work well enough. 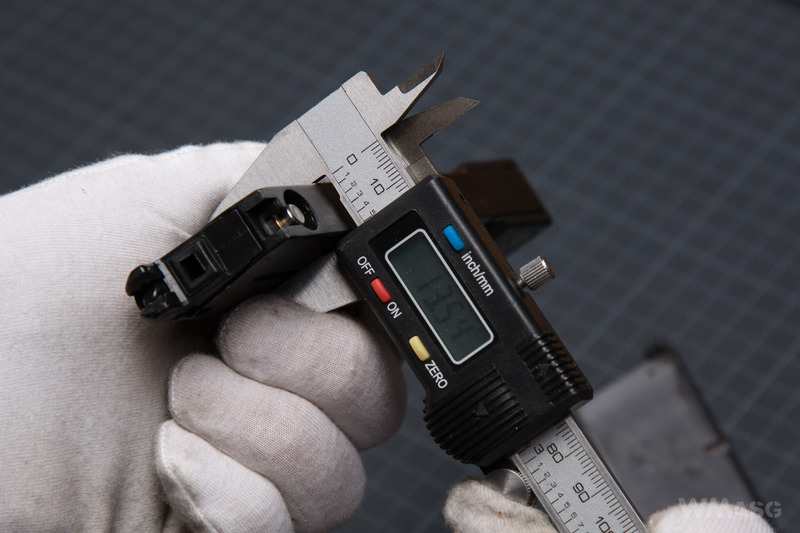 Probably, after taking out of the box you will have fix something, like the HopUp adjustment in the tested unit. But if the manufacturer's assurance of reinforced inner parts will be confirmed during prolonged use, in my opinion "you will be satisfied". 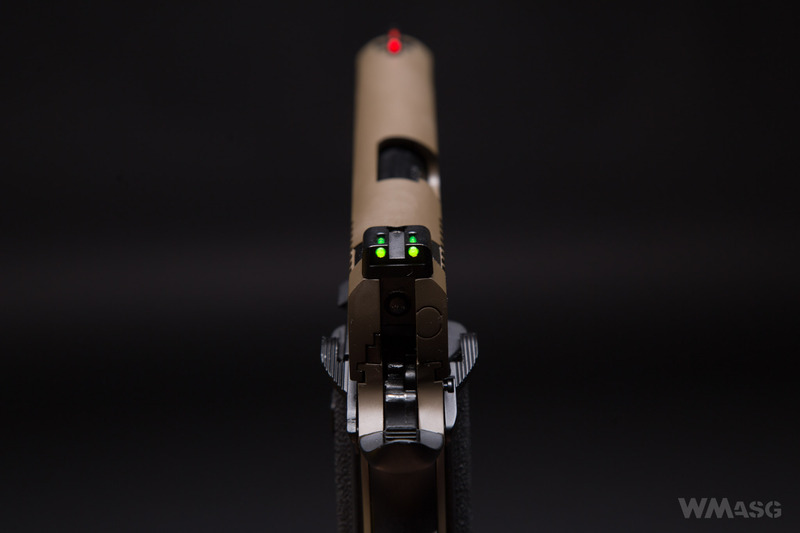 We would like to thank Taiwangun.com for making this review possible. We received to accessory magazines for the R32 pistol from Taiwangun.com - one powered by green gas and the other, of the same dimensions, powered by CO2. Both are standard, short magazines, holding 27 BBs. Muzzle velocity measurement using the accessory magazines. 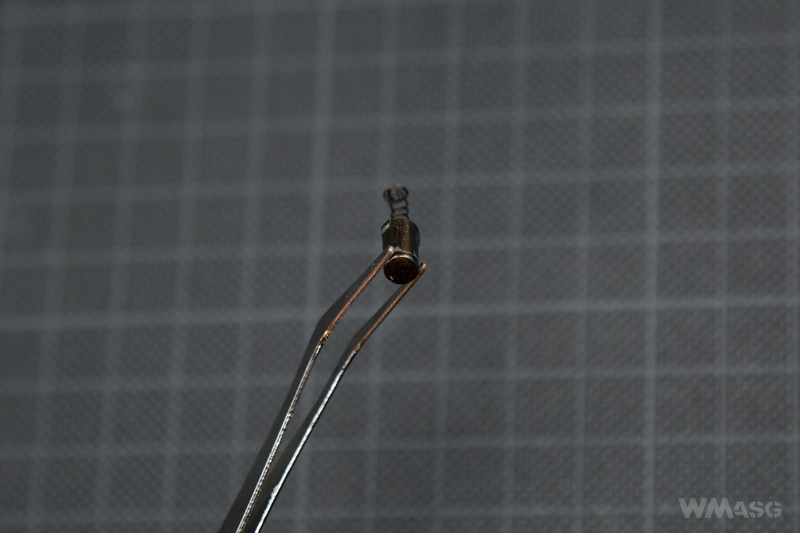 0.2 g BBs, HopUp set at zero, ambient temperature 23ºC. 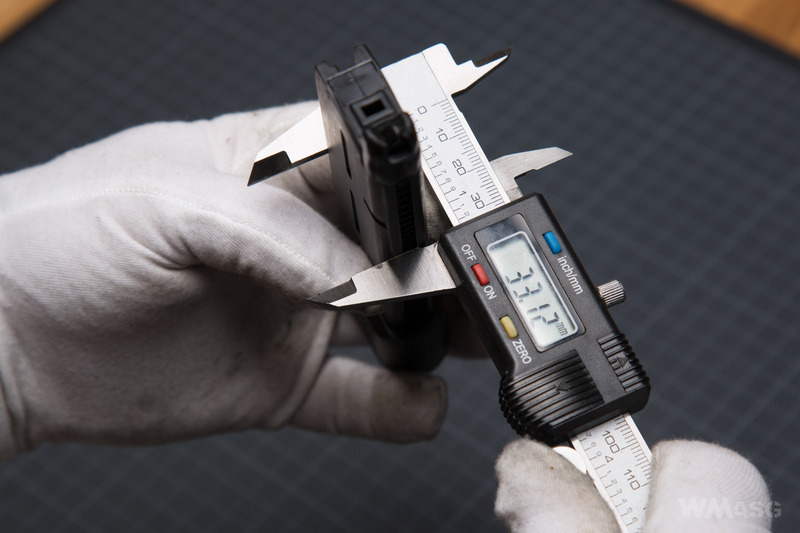 The measurements were made with the XCORTECH X3500 chronograph. On one CO2 capsule was enough to fire three full magazines - 81 BBs. Only when firing the fourth magazine did the gas end after 5 shots. 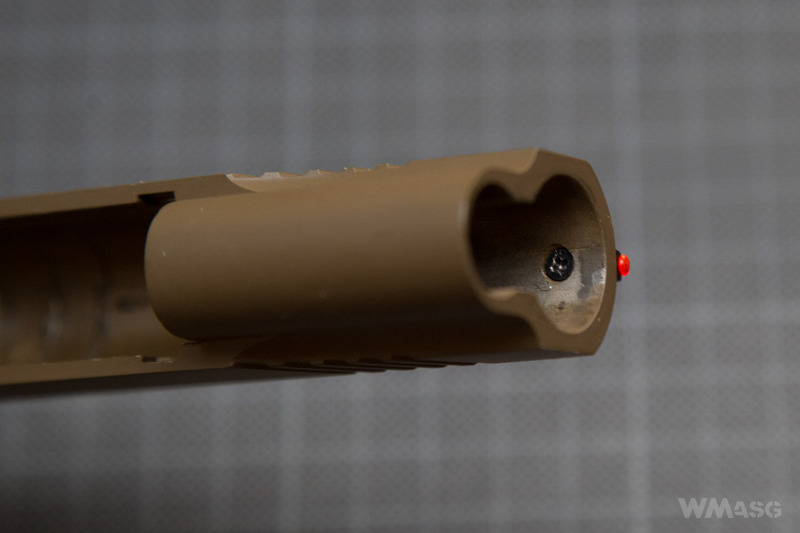 The green gas magazine allowed to fire 41 BBs. 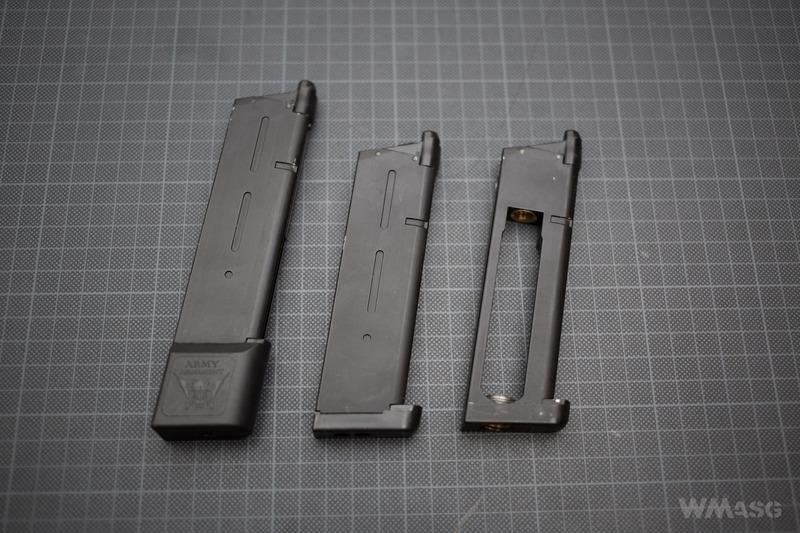 In my opinion, buying a CO2 magazine is an option worth considering. The pistol is clearly more dynamic when using CO2. Zaprezentowano pierwsze zdjęcia repliki ASG GBB firmy Army: Springfield Armory MEU .45. Firma Army wprowadza na rynek wersję srebrną pistoletu ASG GBB MEU 1911.